Erhalten Sie einen intimen Einblick in die Kolonialgeschichte und das Inkaerbe von Cusco während dieser 4-stündigen privaten Führung durch die Geschichte. Bewundern Sie die spanische Architektur und Kunst im Inneren der wichtigsten Kathedrale, und schauen Sie sich die „Coricancha“ an, einen Inkatempel, der heute ein Kloster ist. Außerdem besuchen Sie die Inkastätten von Sacsayhuaman, Kenko, Pucapucara und Tambomachay. It was nice to get away from our big tour group for a couple of hours. We went to a couple of Incan sites including the cathedral in the town square, snacks were also included in the price. It was not a bad tour but it certainly was not the best either. I felt that the time for the tour was too short (even if we exceeded for about an hour) for the itinerary because it did not give us enough time to take pictures and enjoy the scenery. We felt the experience was somewhat rushed. Our guide, Gabriella, was very nice and extremely knowledgeable. We were able to move at our own pace and choose what we wanted to see and hear more about we learned so much and had some laughs along the way. I highly recommend this tour! Our tour guide, Gabriela, was very knowledgeable, easy to understand and very nice. 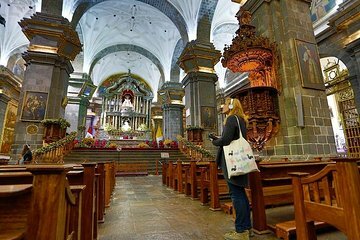 Highly recommended this guided tour in Cusco. Viator used Rainbow Mountain Tours and my two sons and I were extremely lucky to have gotten Gabrielle sp? as our guide. On a scale of 1-10 she was over- the- top-terrific! She was accommodating altitude sickness delayed departure, very knowledgeable, and obviously excited about what she does. We had a great morning touring Temple of the Sun, the cathedral on Plaza de Armas, and outside town ruins of Sacsayhuaman, Kenko, Puka Puka, Tambochay - all worthwhile . Guides are extremely knowledgeable and can answer any aspect of Peruvian life. It has added so much to our trip to have a private guide in Lima and Cusco.